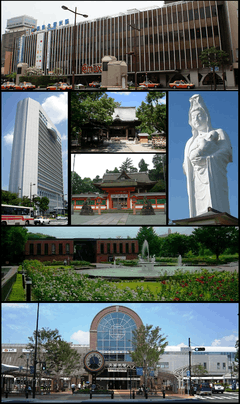 Kurume (久留米市, Kurume-shi) is a city in Fukuoka Prefecture, Japan. As of February 1, 2010, the city has an estimated population of 303,277 and a population density of 1,319.51 persons per km². The total area is 229.84 km². On February 5, 2005, the town of Kitano (from Mii District), the towns of Jōjima and Mizuma (both from Mizuma District), and the town of Tanushimaru (from Ukiha District) were merged into Kurume. Traditional products of Kurume are the kasuri (絣), roughly woven indigo dyed cloth; pork soup (tonkotsu) ramen noodles; and trays and bowls made from rantai shikki (籃胎漆器), a composite made from lacquered bamboo. Kurume Station is served by the Kyushu Shinkansen and Kyudai Main Line east to Oita, while Nishitetsu Kurume Station is served by the Nishitetsu Amagi Line. Plot: Yutaka was fourteen years old when he was run over by a car and fell into a coma. Now, ten years later, he wakes up and realizes that his family is not intact anymore: father, mother and sister live at different places. Yutaka decides to re-open the pony farm that his family once ran.